August 15, 2013: Two years ago, Cadillac absolutely floored us with the debut of its gorgeous Ciel concept at the Pebble Beach Concours d'Elegance. And since that droptop four-door's debut, we've seen plenty of its design language worked into the latest Cadillac products. Now, we're seriously hoping that history will repeat itself with this stunning new Elmiraj coupe concept, which makes its first public appearance in Monterey this week. Cadillac states that the Elmiraj concept simply showcases the next step forward for the brand's Art & Science design DNA, and doesn't necessarily preview an upcoming model. But if you told us the Elmiraj was a conceptual look at the next-generation CTS Coupe, or a smaller, two-door version of a new flagship, we'd believe you. At 207 inches long, 76 inches wide and 55 inches tall, its dimensions are only slightly larger than the current two-door CTS. Regardless of what the Elmiraj does or does not become, it's certainly a fantastic modern interpretation of the classic GT formula with its short front overhang, long hood, rakish roofline and petite rear deck. The strong character lines running along the sides and exaggerated 22-inch wheels round out the beautiful coupe, and Cadillac's signature vertical LED lighting elements are found at the front and rear. Also take note: the badge on the grille is a crest without a wreath, basically confirming our earlier report. 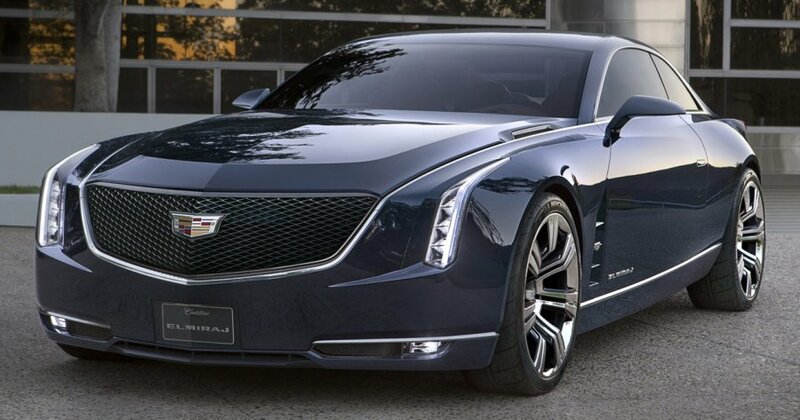 The Elmiraj wears Cadillac's new Vsport model designation, and for good reason. Under the hood is an all-new, twin-turbocharged 4.5-liter V8, estimated to produce 500 horsepower and 500 pound-feet of torque. That should make for a rather quick coupe, even with the roughly 4,000-pound curb weight of this concept. Inside, the Elmiraj follows the proper GT theme with a four-person seating configuration and a raised center console that spans the length of the cabin. 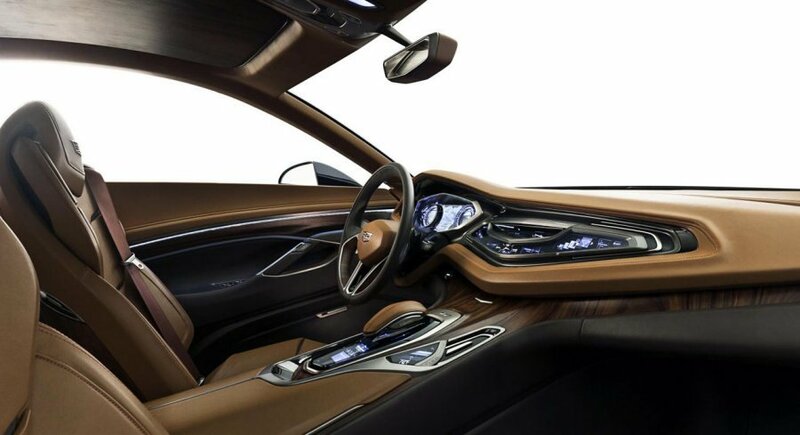 Backlit titanium trim nicely contrasts the caramel-colored leather upholstery, and the interior is finished with fallen Brazilian Rosewood accents, which are hand-cut into three-dimensional sections for "perfect control of the grain flow," according to Cadillac. Special attention was paid to the rear seats, as well, where a new "valet feature" moves the front seat up a full 10 inches, and slides the rear seat four inches forward to meet the passenger. The rear seat then moves back into its original position with the passenger in tow. And hey, those rear seats even recline. We'll have more photos and impressions of the Elmiraj as part of our Monterey coverage this weekend. For now, scroll down for Cadillac's official press blast, as well as a pair of videos showing the new concept from every angle (and in motion).